Bill, they're serving cheater pints and 16 ounce pints together? 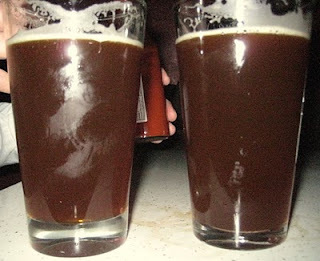 These were two pours you got at the same time, right? Yes. Does that make it better or worse? I had the exact same experience at Beulahland. Margaret got a 16'er and I got the cheater. I almost suspect they don't know they are using cheaters or don't care. If I ever do go back there and that happens again, I will be more brave and tell them. I think they need to hear it...the more times the merrier. Those glasses are not just wack for beer geeks, they're wack for those who want to get their money's worth, especially considering the BL positions itself as a blue collar type of venue. Angelo, I thought about telling the bartender, but our impression was that he didn't care what we thought, and it didn't seem worth the hassle at the time. Instead I came home and tattled over the internet. Thanks for the info, I will be sure to avoid this place. Cheater pints are a rip off. We work hard for our money, and with beer prices going up, we want what we pay for. it definitely seemed to me that the cheater was just mixed in somehow to the real pint glasses. Out of all the pints we got that was the only cheater from what I recall. Anyway I never had that high of an opinion of the place but for a dive bar they still have a nice beer selection and the atmosphere reminds me of the punk/alternative bars in SF which I like. P.S. are you going to review Spints too? It makes it illustrative. I have long tried to make the point that pubs don't have to have either cheaters or 16 ouncers. If they have shaker pints, you just don't know. I want to thank you from the bottom of my heart for finding definitive proof of my thesis. Kudos! @Samurai: I'm probably not going to write about Spints this week. I'm hoping you or Charles will. @Jeff: Glad to be of service. I was going to review Spints for the blog but I completely forgot my camera. I cant review it without some photos of the place and food. That would be lame. I guess I will have to go back again! Meanwhile I just wrote a post about why everyone should endorse Cascadian Dark Ales!